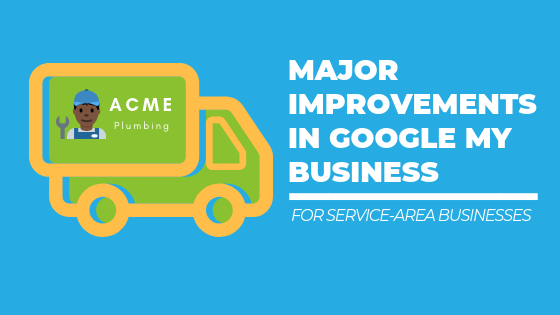 When it comes to service area businesses like plumbers, electricians, landscapers, and other service businesses without a physical location, Google My Business (GMB) local business listings have come up short. But not anymore. Google My Business has added improvements to its listing service for service area businesses. The latest features improve the GMB user experience for service area businesses and make it easier for customers to find them on search engines, including Google Maps and Google Search. Yesterday, GMB announced via Twitter and the Google Outreach Initiatives Blog new features for service area businesses. That’s a major shift, and a huge step forward. At BizIQ, we’ve been following this issue closely because it affects a significant number of small businesses, especially when they need to initiate an owner transfer of their Google listing. But besides the owner transfer issue, it was often virtually impossible for some types of service are businesses to verify their Google business listing. What changed in Google My Business and who can sign up? GMB now lets service area businesses including those without a storefront or other physical location share the specific areas they serve, as well as communicate with potential customers searching for businesses like yours on Google Maps and Google Search. It looks like the latest changes mean that businesses who operate their business out of a home office and/or their service vehicles, but who visit customers or meet with customers during their published business hours are now eligible to represent their business on Google. If this is true, then this latest change is truly one of the most important shifts in Google policy towards service area businesses. In the past, to create a listing on GMB, the business owner or employees had to make contact with customers during stated hours posted on a sign at your business location. Google’s current guidelines don’t mention home-offices, and neither does their announcement, but the opening paragraph in their blog post on the new GMB features for service are businesses uses a “22 by 14-foot sprinter van” as an example of what constitutes office-space. How does the GMB sign-up process work for service area businesses? If you already have a business listing on Google, you can edit your listing information from the GMB dashboard. When you log in, you’ll see that Google now allows you to edit your service area and your “storefront address” separately. You can even delete the “storefront address” from your listing if your business is one where you visit customers, but they don’t come to you. If you’re signing up and verifying your business on Google for the first time, the Google My Business sign up is simple, and Google will walk you through the entire process. Furthermore, when you sign up, you’ll have the option to include a storefront or office address that customers can visit, but if you choose not to, Google will automatically give you options for your listing that are tailored for service area businesses. You can then set your service area by the cities or postal codes your business serves. How will a Google listing help my small business? Google’s free online business listing service, Google My Business has been one of the most powerful tools in the arsenal of small businesses, including service-area businesses. A GMB listing helps local customers find your business on Google Maps, and in Google Local Search. Plus, when customers find your listing on these Google products, your business listing displays a host of information about your business. In addition to your website, having a Google business listing provides you with even more opportunities for customers to find you. Like we mentioned earlier, Google makes it easy to sign up. However, sometimes the process to get your business listing verified isn’t always as quick and straighforward as it sounds. If you’re having problems or you’d just like some extra guidance, we’re here to help. Fill out the contact form, and we’ll help you get your listing fixed and verified in as little as 10 minutes.